More than 50 people gathered at Mount Pleasant Neighbourhood House on October 11 to hear first-hand accounts from five storytellers whose lives are deeply touched by the fentanyl overdose crisis. This event marked the first in a series of six dialogues and overdose prevention trainings at neighbourhood houses around the city, in partnership with Megaphone Magazine and CBC Vancouver. Behind the scenes, volunteers from the Kwayatsut Community Engagement group provided hospitality. for those who came to came to listen and learn, as well as the survivors and front-line responders who shared their stories. Many members of the group have similar experiences of displacement and addiction, and have lost loved ones to overdose. Most have been gathering at our House every Monday for several years, along with Jolene Andrew—the Aboriginal Community Developer here at our House. 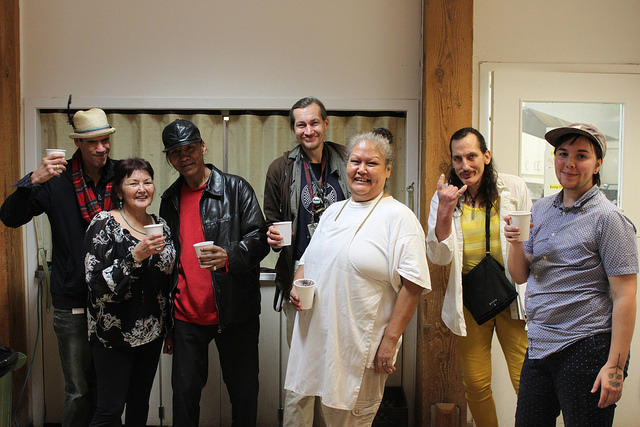 Since June 2017, the Kwayatsut Community Engagement group has led Project Smoothie along with the Mount Pleasant Food Network and the Greater Vancouver Food Bank, giving back to the community in a sweet way. Three days a month, a team of volunteers serve 300 nutritious drinks to people as they wait in line at the Mount Pleasant food hub to receive food assistance. For this special gathering, Barb Bourdon and Mamie Charleson blended up a fresh batch of banana-blueberry smoothies, and served mugs of hot herbal tea. At age 61, Viola Mellish (Kwakwaka’wakw) is a volunteer at our House, and came to the event to welcome people and get a free naloxone kit. She has lived in Vancouver for four years, but was born and raised in Alert Bay and also lived in Victoria for a short time. 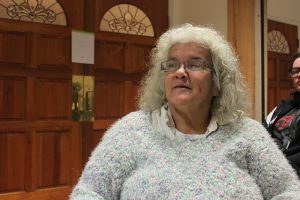 After two years of homelessness, Viola found housing in the Mount Pleasant neighbourhood, and participates in the Kwayatsut Community Engagement group. Viola is no stranger to addiction, but vowed never to use drugs again after having life-saving surgery a number of years ago. Still, she has felt helpless in the face of the overdose crisis after witnessing a man dying in Pigeon Park. Now she has a naloxone kit for the backpack she totes on her wheelchair, and she knows how to use it to save lives. Viola hopes her story will inspire people to follow her lead in helping others and themselves. You can learn to save a life! The College of Pharmacists of BC provides online resources to help people learn to identify and respond to overdose situations. Free Naloxone kits are available through Vancouver Coastal Health at the Robert and Lily Lee Family Community Health Centre (1699 East Broadway at Commercial Drive).